*How Many Pieces Do You Want? Made from a strong metal material, AiryHair alligator clips are a great tool and accessory that every girl and every professional hair salon should have. Hairclips have so many different uses and that’s what makes them so useful and great to have around at all times. The reason why these clips are called alligator (or crocodile) clips is that their shape looks like an alligator mouth. Pretty cool, right? 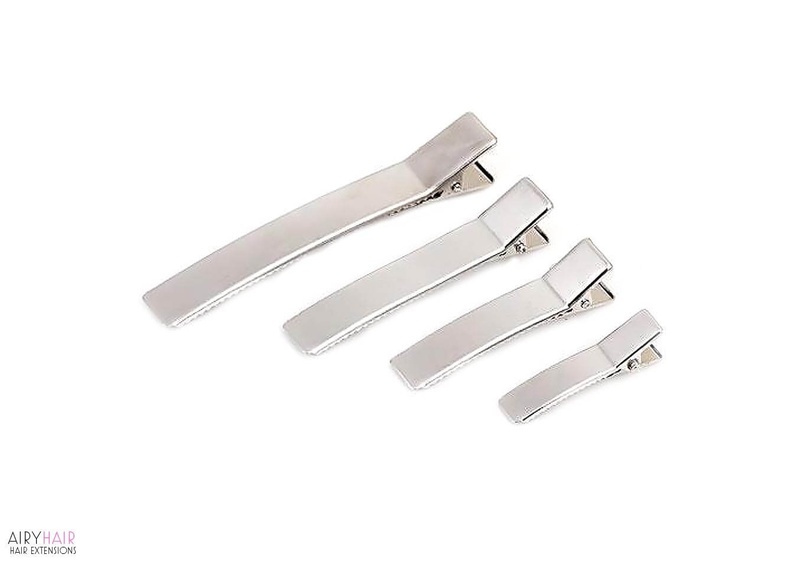 If you’re a hairdresser, you should stock up your salon with these clips because they always come in handy in so many situations. Hairclips are one of the most essential tools for any hair professional, so order your AiryHair clips now. • AiryHair clips are made out of the best materials that ensure longevity and sturdiness. This material will not rust which means it is high-quality. • Their spikey surface, like alligator’s teeth, grip tightly to the hair holding it in place, making them a lot better choice than regular clips that often slip out of the hair. The bottom part is smooth and will rest comfortably on your head. • To open them, you simply press on the clip, which makes it extremely easy to use and handle. • The blades are made out of very thin, but strong metal which means that you can hide them in the hair very easily if you want to. But their metal color is very trendy, so you can show them as well and wear them as a cool accessory. • Alligator clips are perfect for literally all hair types: thin, thick, short, long, straight, wavy, and curly. • Sizes in inches: 1.57" x 0.27" ; 1.77" x 0.27" ; 2.2" x 0.31" ; 2.95" x 0.31" ; 3.85" x 0.39"
The reason why these hairclips are recommended for salons and personal use as well is so many different ways that you can use them. They are so versatile and multifunctional and will immediately become one of your favorite tools and accessories. 1. One of the obvious uses is simply getting hair out of the way. Oftentimes you get a few annoying strands falling out of your hairdo. With alligator clips, you can simply put them away so that they’re not bothering you. 2. Alligator clips can be used to make so many different hairstyles. Whether you simply want to get hair out of the way, make a bun, or any other kind of updo, these hairclips are the perfect helpers that will fasten your hair tightly. A great classic hairstyle that you can make with an alligator pin is a French twist. It’s not the easiest hairdo to make, but with these cool clips, it becomes a breeze. 3. Hairclips will also come in handy when you’re sectioning hair. Simply take a part of the hair, twist it around and secure it tightly with an alligator pin. 4. Curls are very beautiful, but sometimes they can be a handful and hard to manage. Hairpins are the perfect solution for this problem because you can stop stubborn strands from getting in your face, or clip your hair in a simple hairstyle. 5. Rollers are another tool that becomes more manageable with hairclips. When you roll your hair, you can use clips to secure the rollers because it’s very important that they don’t fall out. That is particularly important if you plan on sleeping with the rollers. 6. You can use the clips as a fashionable accessory. And if you want to make them look more special, you can add color and small objects on it to make it more colorful and unique. You can line the pins with different fabrics, add glitter and sparkles, glue on bows, jewels, ribbons, flowers etc. This is where you can show off your creativity and unique personal style. That’s what makes them perfect for a cool DIY project. Thank you for your interest in our professional metal clips. The shipping usually takes around 10 to 30 days when using free method and 1 to 5 business days if you go with the rush delivery option.